I'll be the first to admit that I am the lackadaisical gardener. I never pay attention to planting times or seed placement. I just toss seeds out and wait for good things to happen. If I was serious I'd be able to tell you that I know the pH of my soil or I actually water the garden every day. I am not serious. The winter here was hard this year. It was hard on me mentally. There were days when I thought I'd never be warm again. Sometimes I'd be putting on socks and just start crying. I hate socks and shoes. I hate the way winter clothes make me feel heavy and bulky and sometimes itchy. One of my favorite things about summers in OKC were the days I'd be teaching a class out at the studio on Lake Hefner. I'd pull my top layer t-shirt off so I'd just be wearing my tank top, roll my yoga pants up to my thighs, spray on the sunscreen and ride the scooter from work to the lake. It was glorious. The Kapha dosha in me relishes in the summer heat. This is something I've had to adapt to here. Kansas City just doesn't get as warm. Last week it finally got hot enough to turn on the air conditioner. I laughed at the weathermen when they put out warnings to stay hydrated because it was going to be so hot. "We're looking at a high of 92 today!" 92! That's nothing. I still have to wear a jacket on my rides into work in the mornings. In fact the weather has been the biggest learning curve I've had to deal with since I've moved here. I'm constantly leaving the house in inappropriate weather clothes. My answer to this is to always carry a sweater. But this is a garden entry and I've rambled off. The Garden! I have things other than lettuce coming up out there. 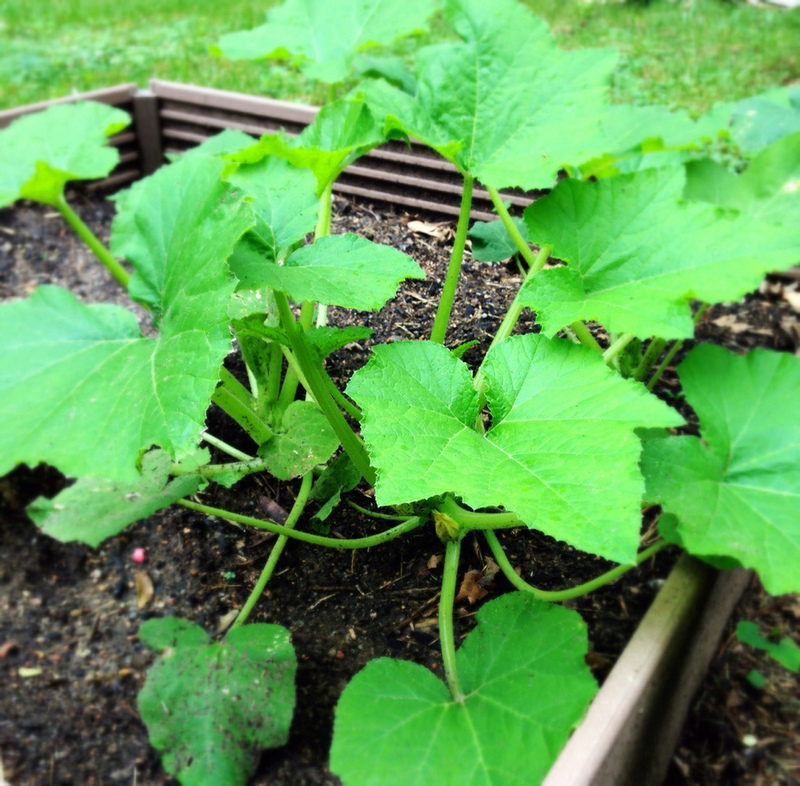 One of the three squash plants even have blooms and if I can remember to sprinkle them with diple dust, I may actually get squash to eat. 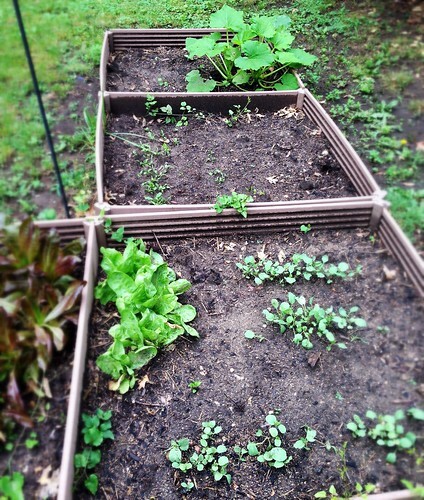 The cauliflower is up, though I may have waited to long to get them in the ground. They may not produce flowers, but maybe I can eat the leaves. I think next year I will be a more active gardener. I will expand and pay more attention to what I'm putting in the ground. I feel pretty good about the things that I did plant though considering I was planting in the middle of a good bought of depression (yeah...I'll give that funk I was carrying around a clinical name). Maybe the act of getting out and putting seeds in the ground helped. There's a lot of maybes in that last paragraph. There are no guaranties in gardening. There are no guaranties in life. There's so many things in my life that I can control but in this area, I have no control. I have to surrender to nature. That's not always an easy thing for me to do. I do not surrender easily. I guess this is why I garden. It forces me to accept and surrender some of that control. Gardening has become part of the practice, the yoga and meditation. It is another healing balm. And my salads have been off the hook this week.